Much has changed about health care given in rural communities since the opening of Community Memorial Healthcare (CMH) in 1958. On March 2, 1958, CMH opened its doors to a crowd of 2,500 at its building dedication, with community members standing in the cold and snow to hear the presentation. After its initial opening, CMH endeavored to maintain a reputation for quality care, including up-to-date equipment and facilities. Major expansions of the original building were completed in 1965, 1979, and 1988. The current hospital facility was completed in June of 2011, with the demolition of the original hospital footprint and construction of the South Plaza building completed in 2012. The project cost about $19 million, and was funded through a capital campaign and USDA loan guarantee program. Following the opening of the new hospital facilities, a renovation of the physician's clinics was undertaken in 2016 to combine practices in a central location. Over the course of sixty years, CMH has served over 635,000 patients. "The one thing that has remained constant is the care and dedication of our staff to providing high quality healthcare to our friends, families, and communities," said Curtis Hawkinson, CEO. "We hope that people continue to choose CMH for their care not just because we are close to home, but because they know they will be treated with respect and consistency from a highly qualified staff who truly cares about their outcome," he said. Following the nationwide trend in providing patient-centric care in recent years, CMH has strived to make the patient's experience at the forefront of every decision - from direct patient care to even maintenance and administration. "We strive to continually improve patient satisfaction at every level," said Pam Harrison, who serves as coordinator for CMH's service excellence program, which began in late 2016. "The whole goal of the program is that we are the provider of choice in the region - that people don't just come here because it's conveniently located, but that they choose to come here because we provide quality care and a positive experience. We strive to treat our patients like family, and not like a chart number," said Harrison. Major industry changes in health care since CMH's inception include an increase in emergency room visits, the expansion of services offered through consulting physicians and outpatient visits, and the decrease in length of hospital stay. "Thirty or forty years ago, the primary health care model was based on inpatient stays," Hawkinson said. "Today, 75% of our revenues come from outpatient procedures as technology has advanced into more specialized care. This has resulted in a decrease in inpatient stays, and overall shorter visits, as so much of what was treated in that manner in the past has transitioned into outpatient care." In 2003, CMH was designated as a rural Critical Access Hospital, as part of a national program geared towards supporting rural hospitals and communities. Critical Access Hospitals (CAHs) receive federal funding based on Medicare reimbursement to help offset the cost of services in rural communities, which tend to serve aging and poorer populations. "This designation marks CMH as the safety net of our community," said Hawkinson. "As a non-profit hospital, people can come here to receive care at the exact time they need it, regardless of their ability to pay." 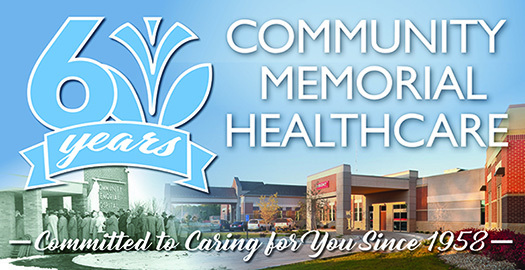 As part of the CAH program, Community Memorial Healthcare was recognized nationally in both 2017 and 2018 as a Top 100 Critical Access Hospital - a recognition awarded to the CAHs who are operating financially lean, while providing quality care and advanced services. Out of the 100 hospitals recognized in the US, only 15 were located in Kansas. Rural hospitals today certainly face their challenges, though, Hawkinson said. Recent policy changes have eroded the CAH program, resulting in closings and additional financial distress for rural hospitals nationwide. "The policy changes, coupled with the amount of care CAHs provide to the uninsured makes it a challenging environment," he said. As a means of coping with the decrease in reimbursement funding, many CAHs have turned to community support through county-wide sales tax. "There are 85 CAHs in Kansas. Out of those 85 rural critical access hospitals, CMH is one of ten who do not receive any tax support," Hawkinson said. Area hospitals who do receive tax support include Onaga, Nemaha County, Clay Center, and Washington County. Operating deficits for CAHs are caused by a decrease in Medicare reimbursement through a federal sequestration, in addition to an increase in the number of people treated who are uninsured. "Marshall County has about 10-12% of the population who are either uninsured, additionally, current health plans have extremely high deductibles which are usually unmet," Hawkinson said. "In 2017, CMH provided $1.3 million in uncompensated care to our patients." Being a healthcare facility that is open 24 hours a day, seven days a week, 365 days a year brings staffing challenges, as well, Hawkinson said. "The benefit to serving in a rural community though, is that we have dedicated staff members who live in our communities and truly care about our patients, as they are our neighbors and family." "As we reflect over the last sixty years, and plan for the next sixty, our patients are at the heart of our decisions here - how can we continue to provide convenience, quality, and the specialized treatment that each of our patients deserve?" Hawkinson said. "We appreciate the support of Marshall County residents and our patients from the surrounding region that have given us purpose and drive over the past 60 years, and we look forward to continue to serve you well into the future."